JOIN VENTURA BLVD'S RESTAURANT ROW!!!! OWNER WILL CONSIDER A PARTNERSHIP FOR NEW CONCEPT! LOCATION LOCATION LOCATION. Tarzana is fast becoming the epicurean epicentre of the West Valley fueled by the expansion of Tarzana Village Walk. The City Walk is well designed , and was a desperately needed new development which has become both an economic and demographic driver forthe Tarzana retail and restaurant market. Space this size with a full kitchen and TWO fully operational hoods is almost unheard of and with rent at a mere $1.65 PSF (ALL IN), versus $2.00 plus in the same trade area. Bring your concept and launch on prime Ventura Blvd. real estate, perfect for high end pizze beer and wine, a casual Mexican concept or something with broad appeal. Your space planner can open up this storefront to the street with a new facade , install a rail to enclose a small patio area and Voila! Blvd seating with excellent visibility. Tarzana is hungry for unique restaurants and demand is high for for "casual gourmet" with beer and wine, and this space is absolutely perfect with a list of very credible national brand neighbors and other high visibility retailers very soon to come. Rents in the new development are running North of $4.00 PSF. 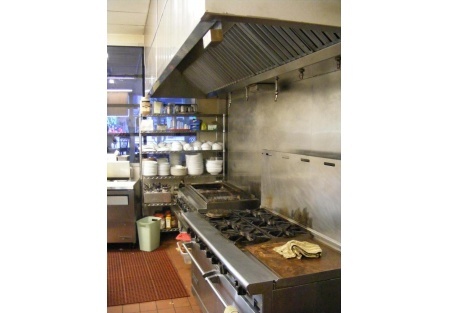 Rear kitchen has full hood and grease trap and efficient cooking line. The front hood can be removed or used for display cooking such as a wood burning pizza oven, Tortilla wheel or visual prep area. A new restaurant concept called Towne opened adjacent to this space and is being met with great local response!!! TENANT WILL CONSIDER PARTNERSHIP FOR NEW CONCEPT!! POSSIBLE FRONT PATIO SPACE BORDERS VENTURA BLVD.